Oh,I loved this book!. The comparison to "To kill a mockingbird" is not misplaced,but the style of writing is different.Anita and Me ishillarious,irreverant,refreshing and poignant at the same time. This semi-autobiographical book by Meera Syal is about a young immigrant girl growing up in a British mining village in the 60's. Meena (the protagonist) is torn between two cultures: her Punjabi roots and the need to fit into the mainstream Tollington culture. She prefers Fish and Chips to Chappatis ; Christmas to Diwali. The narrative is slow and idyllic ,but is spiced with exceptionally cheeky writing by Meera. Her take on her parent's friends-the uncles and aunties that visit them and her parent's relationship with one another is heart-warming and funny at the same time. The way she describes the neighborhood and her neighbors is chuckle-inducing. Meena's life changes when Anita walks into her life.Anita is brassy and in-your-face and everything Meena is not.This is precisely what fascinates Meena and she desperately wants to be Anita's friend. Meera expertly paints the relationship between the two girls in not just blacks and whites but in shades of grey. Meena and Anita become the best of friends,despite several undercurrents that run between them and Meena finds herself doing uncharacteristic things like lying and stealing. She knows on some level that Anita is bad influence on her,but continues to toe Anita's line,listening to her whims and fancies.Rest of the story is about what happens between the two girls and other members of their "gang". 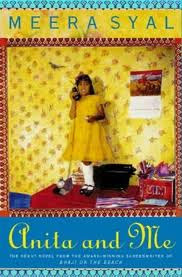 Meena learns hard lessons in life about love ,friendship ,bereavement and "grows" up in the process. The narrative is not fast-paced,but it felt like every word in that book was there for a purpose . You can find oodles of witticisms thrown liberally in the book .A must read for anyone who likes witty, coming of age stories. I am so glad i picked this book!. My last book was also a coming of age story (The secret life of bees), which I didn't like too much This book is feisty and spirited,whereas I found secret life of bees needlessly meandering and(a little) boring. Anyway,pick up this book- you won't be disappointed.